This is super-evident with the first match. TM61 has spent a month losing to the teams in the title scene and the Authors of Pain, so they need a TV win to re-establish their credibility. To do this, they bring out Arya Daivari and Tony Nese, still hanging around Florida for the CWC. It's a fun little match, but it means absolutely zero for NXT or the tag division. It's just a match to give TM61 screen time and remind everyone of their relative position on the roster. And when you only have one hour a week to do everything, it's tough to do everything. And so the show suffers. Compare this to the small amount of story and forward momentum that came out of Pentagon Dark vs. Rey Mysterio this week and the difference is stunning. Asuka gets a taped interview about her title defense that's limited by her English skills - when she moves into Japanese, it's like she's an entirely different person. She does the "I've beaten them all, nobody's ready to face me", which usually goes somewhere, probably with Ember Moon, who also has a match tonight. Steve Cutler cuts a promo before his match later with Shinsuke Nakamura where he repeats the "I don't care if you like me / love me / hate me" bit from last week, so that's gonna get old fast. Ember Moon's jobber is Leah Von, and the standard match of this type ensues - early Ember Moon offense, a short sequence where Von comes back, and then quick destruction from Moon. The finisher doesn't have a name yet... or does it? Corey Graves said "Ember Moon just eclipsed Leah Von", and The Eclipse wouldn't be an awful name for it. The upper midcard shuffle is confirmed, as No Way Jose cuts a backstage promo on Bobby Roode, and Cien Almas wrestles Austin Aries. 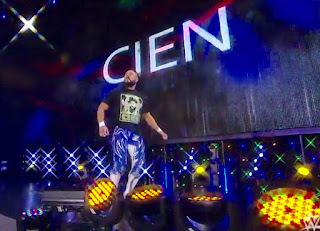 Cien has traded out the stupid suspenders and hat for his WWE merch shirt, which is a good move. It's a solid, competitive match, if less than fully crisp, and Aries wins with a powerbomb into the Last Chancery. And finally, Steve Cutler vs. Shinsuke Nakamura with Samoa Joe on commentary. Joe is strangely contrite, and mentions "a couple other things" in addition to his storyline jaw injury, which sends me to Google, which turns up nothing real. So I'm suspicious. Structurally, this is much like the Ember-Von match - a brief Cutler comeback followed by Nakamura destruction. No post-match swerve, though. Joe walks off backstage during Nakamura's celebration, head down, so they may be going for a slow burn. The last two quarterfinals are tonight, and next week we'll have the semifinals, the finals, and apparently an exhibition tag match between Gargano-Ciampa and a team to be determined to pad out the two hour finale. Noam Dar vs. Zach Sabre Jr. is up first. It's all VERY technical and VERY tactical, full of reversals and counters, and while it's very good, it's "appreciate" good more than "enjoy" good. With a story behind it, it could have been amazing. The finish is super-impressive, though, with a completely unique and vicious-looking double-arm submission. Word on the street is that Sabre Jr. did n't sign with WWE, which is probably for the best - good luck trying to get Sabre AND Gallagher over in the same division. So the final four are Perkins, Sabre Jr., Ibushi, and Gran Metalik. Japan, England, Mexico, and Filipino-American. I'm not making any predictions, but I will point out that so far, Perkins and Metalik are confirmed for Raw, and Sabre Jr. and Ibushi are not. If that comes into play, and it might, put your "money" on Perkins.